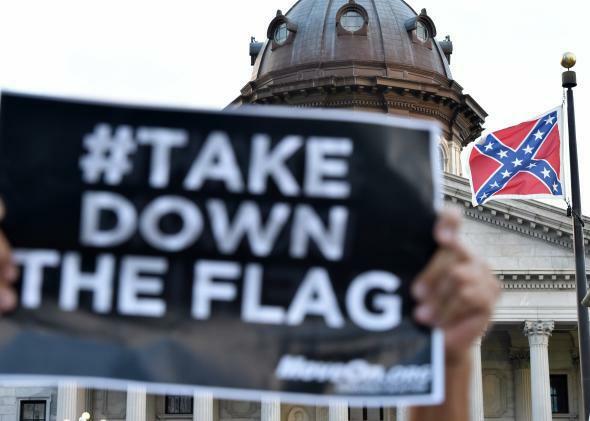 Mitt Romney, Jeb Bush call for removing Confederate flag from South Carolina Capitol. Hundreds of people protest against the Confederate flag during a protest rally in Columbia, South, Carolina on June 20, 2015. Former Florida Gov. Jeb Bush wasn’t as direct but his words left little room for interpretation. In a post on Facebook, Bush said that his position “is clear” on what should be done with the flag. “In Florida, we acted, moving the flag from the state grounds to a museum where it belonged,” Bush said. “This is obviously a very sensitive time in South Carolina and our prayers are with the families, the AME church community and the entire state. Following a period of mourning, there will rightly be a discussion among leaders in the state about how South Carolina should move forward and I’m confident they will do the right thing.” Bush’s words appeared to closely echo President Obama’s views on the issue. “The president has said before he believes the Confederate flag belongs in a museum, and that is still his position,” spokesman Eric Schultz told reporters aboard Air Force One on Friday. Other Republican contenders got close to the line but fell short of saying the flag should be removed outright. Carly Fiorina, for example, said she agrees the flag is a “symbol of racial hatred” but her “personal opinion is not what’s relevant here,” according to the Associated Press. Senator Ted Cruz of Texas, meanwhile, told the Washington Post that South Carolina is the one that has to decide what to do about the flag. “I think that’s a question for South Carolina, and the last thing they need is people from outside the state coming in and dictating how they should resolve that issue,” Cruz said.